StumbleUpon is a social media website and can be a good source of traffic if you network wisely and have some interested readers who will stumble your website or blog and share it with others. As far as Opera users are concern, StumbleUpon doesn’t provide any official support for a StumbleUpon toolbar on Opera at all. The stumbleUpon toolbar is only supported officially on firefox and internet explorer at this time of speaking. Luckily, the good people at “StumbleUpon for Opera” had made this StumbleUpon toolbar (it’s actually a menu) on Opera possible. 3. Click on the Advanced > Toolbars. 4. 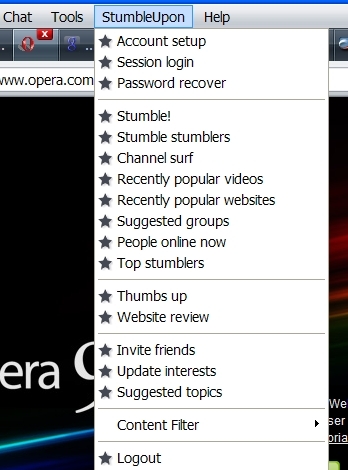 Select StumbleUpon for Opera and click Ok.
5. Done! The end result is that you will see a new menu titled StumbleUpon. Tested with the newest Opera 9.5 release and it works like a charm.